Nessus® is the industry’s most widely-deployed vulnerability and configuration assessment product. 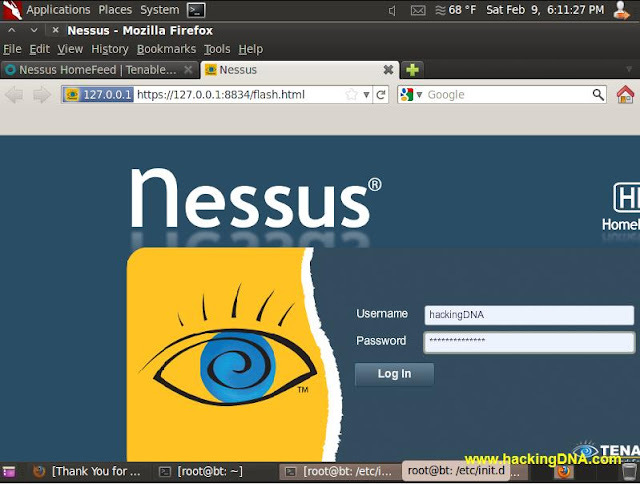 Nessus features high-speed discovery, configuration auditing, asset profiling, sensitive data discovery, patch management integration, and vulnerability analysis of your security posture. Fueled by Nessus ProfessionalFeed®, a continuously-updated library with more than 50,000 individual vulnerability and configuration checks, and supported by an expert vulnerability research team, Nessus delivers accuracy to the marketplace. Nessus scales to serve the largest organizations and is quick-and-easy to deploy. Now your browser will open automatically , enter all your details to register for an activation code . Check your E-mail now for the activation code . After submit your details you will get a thank you registeration message . Enter your login name and password as shown in the below image . Check you email id and open nessus registeration email . Copy the activation code . Now open a new terminal /Konsole and enter the command as shown below with your activation code . To start nessus goto > Backtrack > Vulnerability Assessment > Network Assessment > Vulnerability Scanners > nessus start . Click on I understand the risk . See the below image for more help and see the next image for further process . 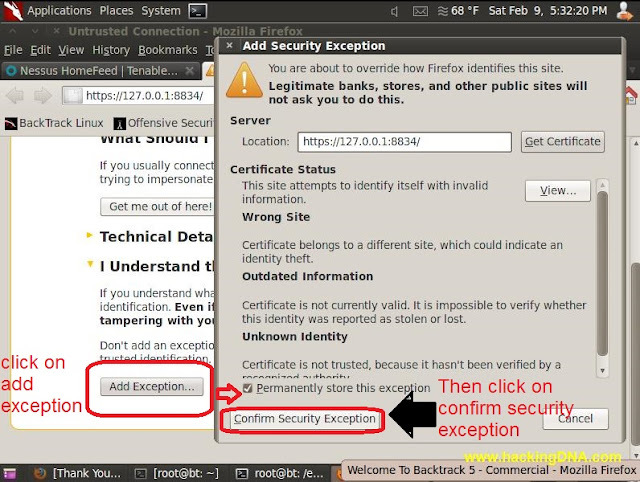 In this step cllick on "Add Exception" and the click on "Confirm Security Exception ". 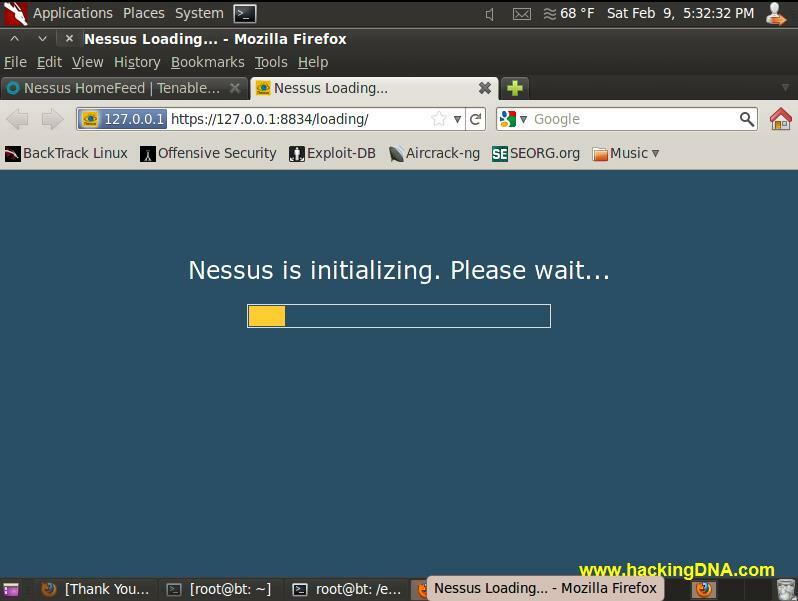 Nessus is initializing , it will take time , so have some coffee . 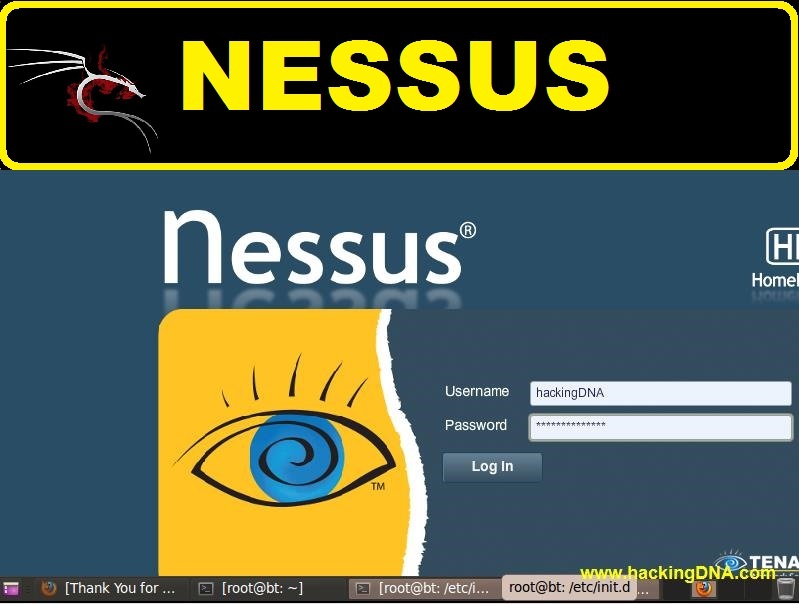 Now your nessus login screen will display , enter your username and password to access nessus . This is a one-time code. 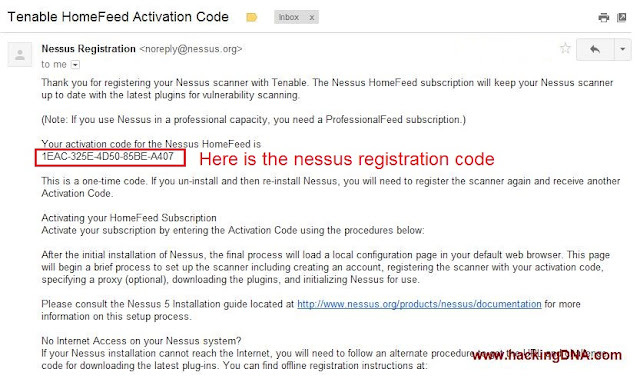 If you un-install and then re-install Nessus, you will need to register the scanner again and receive another Activation Code. 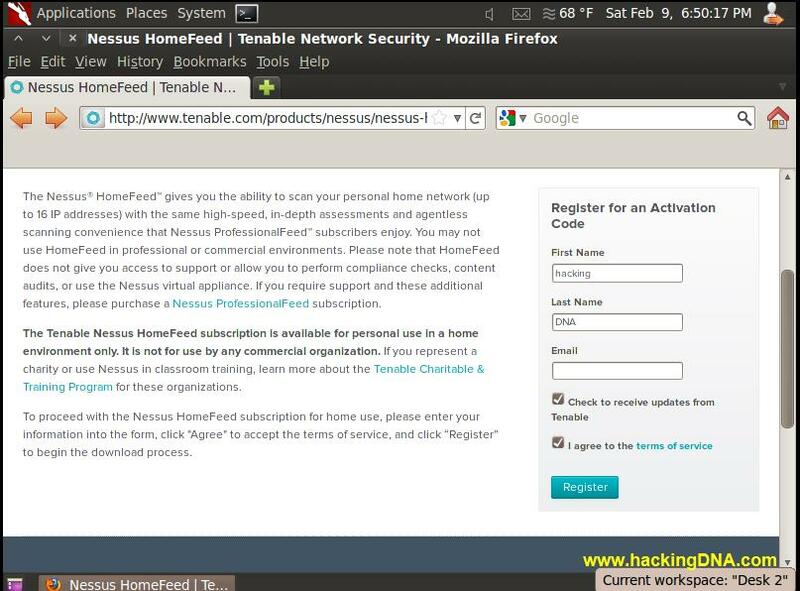 If you use Nessus in a professional capacity, you need a ProfessionalFeed subscription. 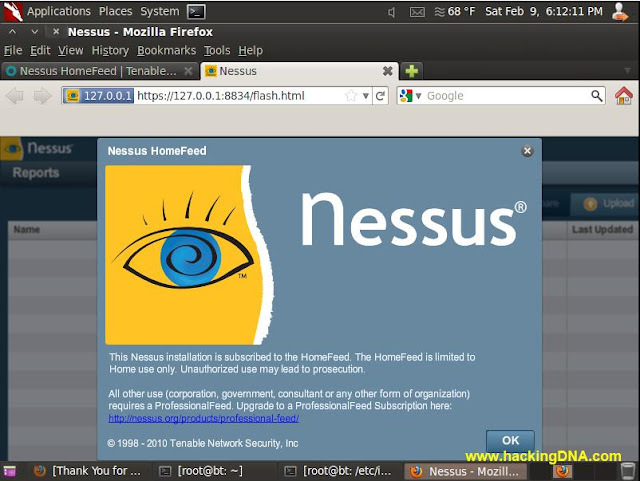 This tutorial is just to learn how to SETUP NESSUS ON BACKTRACK 5R3 GNOME . 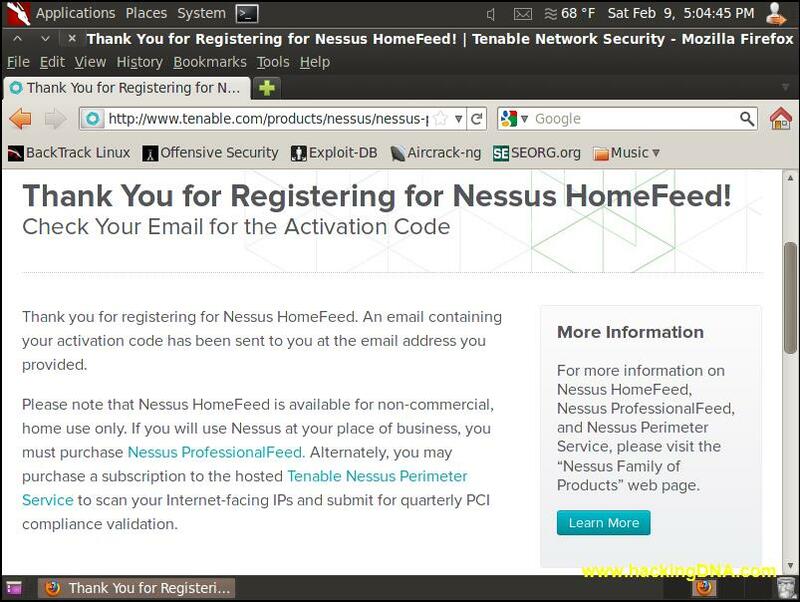 All credit goes to the nessus team for this industry accepted software . 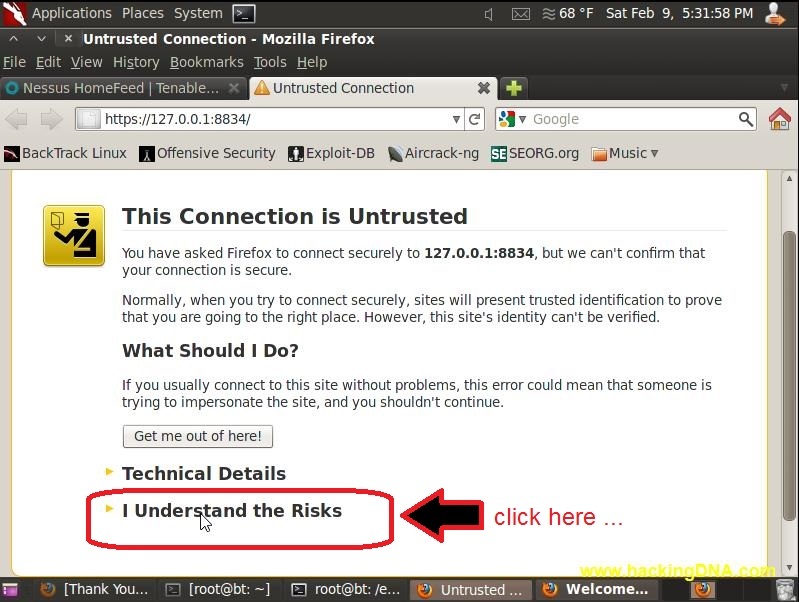 Keep learning with hackingDNA.com and improve your security testing skills .